Use one of these free dining room table plans to build a place for your family to gather, eat, and create memories. You'll find a table to fit small to large dining rooms on the list below. There are all different styles of dining room table plans here but if you're looking for a more rustic table, be sure to look at this set of free farmhouse table plans. They're easy to build and will give you a great classic but stylish look. If you like these free dining room table plans, be sure to check out these other free woodworking plans that help you build a kitchen island, wine rack, coffee table, shelf, desk, dresser, entertainment center, bookcase, Little Library, potting bench, tiny house, cabin, birdhouse, router table, deer stand, swing set, playhouse, porch swing, home bar, tree house, jewelry box, loft bed, deck, and Adirondack chair. This free dining room table plan was inspired by a table that cost over $2,000, but you should be able to make this one for around $100. We like this plan because the cutting diagrams and illustrations are color-coded to make assembly easy if you follow along with the written instructions. If you decide to build this table, here are some DIY matching benches to complete the look. Shanty 2 Chic has some other free dining tables that we think are worth your attention such as this roundtable and this Pottery Barn inspired table. 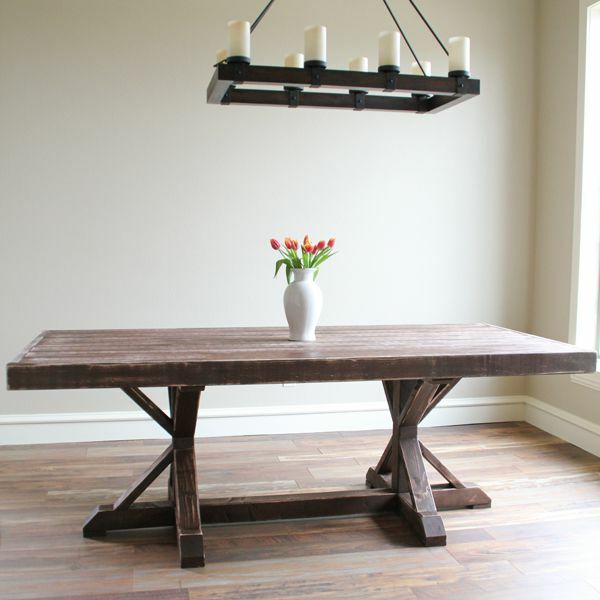 There're lots of things you can build out of pallet wood, including this dining room table. Due to how simple the table is, there aren't many steps to completing it. As you can see in this picture, the table uses hairpin legs instead of wooden legs like what most other tables from this list use. There isn't much to this dining room table either, so it should be relatively easy to construct. Like the dining room table plan above, this table also uses hairpin legs. A supplies list is given for you before all the assembly pictures and instructions/tips. If you have an old door lying around, then this dining room table plan from The Handmade Home may be just for you. Since not all doors are the same measurements, it's essential to read through the steps carefully to adapt the directions to fit your door size. This table could have some originality coursing through it with a custom tabletop pattern. Like the image here, some of the panels could face one direction and the others another. The table stands 30" off the floor, is just over 40" deep, and stretches around 71" from left to right. All the tools, lumber, cuts, and materials that are required to build the entire table are included before the instructions, which are super easy to understand and follow. This free dining room table plan from Designs by Studio C is for building a half-moon table that can extend out to a full circular table top. This might sound confusing to build, but all the instructions and color-coded pictures are present in the plan so that you can fully understand how it works and how to assemble the parts. There's a full materials list and cut list as well as a description of the type of lumber you'll need to build the dining room table. This is just your regular standard table with four legs and a nice even rectangular table top. Be sure to follow the additional steps at the very bottom of the Woodgears.ca website to learn how to attach the frame. Also, see this page for a collection of the assembly illustrations. If you'd rather have a roundtable, check out this round dining room table from Woodgears.ca. They also have a great looking table with a wood-tiled table top here. Here's a free dining room table plan from The Design Confidential that's for a table 7 feet long and 40" deep. The two sets of legs in this particular table are painted with metallic paint to make it look like they're made of metal. The instructions are clear, and the illustrations always color in the piece of the project that the step is describing. Here's another free dining room table plan from The Design Confidential that explains how to build a trestle table. This dining table plan is a bit different than most of the others in this list because it's not constructed entirely of wood but instead requires some plumbing pipe for the legs. If you're into an outdoor or interesting look for your dining room, then this table should do the job. You can even build a matching one for your patio and have the freedom to move them around whenever you like due to the attached wheels. This dining room table looks nice with the two X-shaped legs. It's 5 foot long and around 28" tall. You need a drill, and a miter saw to build this dining room table. All the materials and cutting instructions are included so it shouldn't be hard at all to put together. Also from Sawdust Girl are these X-leg benches that would go great with the table. This free dining room table plan from Lowe's also includes instructions for building matching benches. The whole set is said to cost less than $150 to construct. Before the written instructions is a video so you can get an idea of how the different parts are going to fit together, as well as a list of all the materials and tools the project requires. There are also some helpful diagrams and cutting lists. This dining room table from Lowe's is 78" wide, 36" deep, and stands at around 30". As you can see in the picture, there are some unique designs to the feet of this dining room table, but you can build it all by yourself if you follow the instructions and pictures carefully. 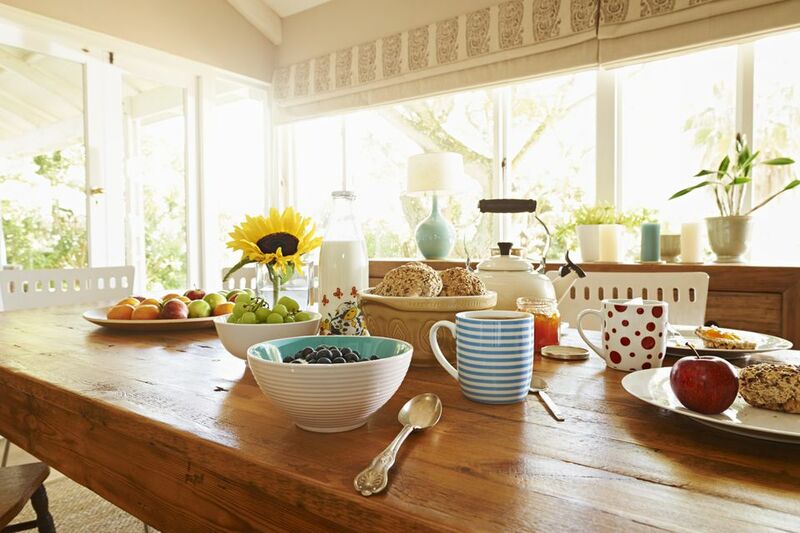 There's a cut list, tools list, and materials list included in the dining table plans, so be sure you have all the necessary items before you get started. The dimensions for this dining room table put it at 30" from the floor, 63" across from left to right, and just over 38" deep. Rustic meets modern in this free DIY dining room table plan from Shanty 2 Chic. The best part is that you can build for only $50 in lumber. This full set of free plans includes a supply list, cut list, step-by-step building directions, diagrams, color photos, and even a video.